Accessories: Accompanied by Patek Philippe Certificate of Origin, original invoice and archive picture and original black strap. Furthermore delivered with Patek Philippe Extract from the Archives confirming production of the present watch in 1942 and its subsequent sale on April 21, 1943. 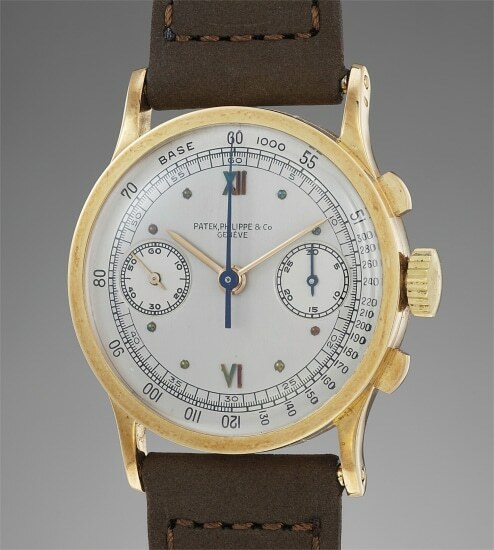 While reference 130 is arguable the best known vintage Patek Philippe chronograph, it is in fact not the only model the company made. One of its closest relatives is indeed the present reference 533. Differing from reference 130 only for the flat bezel, the rest of the Vichet-made case is identical to its brethren. This subtle change dramatically modifies the overall look of the piece, most notably making it appear larger and more angular. As the flat, sharp-edged bezel is the defining feature of the watch, it is of paramount importance for it to be in excellent condition in order for the beholder to fully appreciated the aesthetics of the timepiece. Luckily, the present example is one of the best-preserved specimens of the reference to ever appear on the market. The bezel is as sharp as ever, and the hallmarks are present, deep and crisp. The lugs do not present signs of thinning or tapering, highlighting the superior level of preservation of the watch. As incredible as it sounds, its superior condition is boosted by the presence not only of the original Certificat d’Origine, but even the original invoice (from which one can see this watch was part of a 4 watches order delivered in Geneva to a Spanish client (Mr. José Mullor from Barcelona) on April 21, 1943 - a date confirmed by the Extract from the Archives. Reference 533 was in production from 1937 to 1957, and was made in very restricted numbers. It is estimated that the total production was about 350 pieces, of which only 125 in yellow gold.